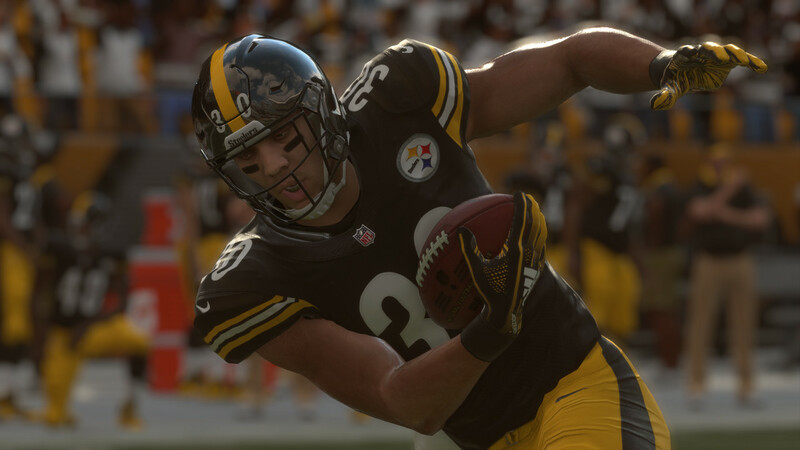 The roster update for Madden NFL 19 featuring ratings changes based on regular season performance through eight weeks has gone live to download all systems. The update includes the just announced signing of Dez Bryant (rated 82 Overall) by the New Orleans Saints. James Conner, who has produced at a comparable level to Le’Veon Bell, remains rated 13 Overall points behind him. Notables on the move in ratings this week include Bobby Wagner (+1 to 98), Jalen Ramsey (-1 to 96), Fletcher Cox (+1 to 95), Cameron Jordan (+1 to 95), Michael Thomas (+1 to 95), Aaron Rodgers (-1 to 95), Adam Thielen (+2 to 94), Damon Harrison (-1 to 94), Richard Sherman (+2 to 93), Philip Rivers (+2 to 92), Myles Garrett (+2 to 92), Cameron Hayward (+1 to 92), Tyreek Hill (+1 to 92), Drew Brees (-1 to 92), Everson Griffin (-2 to 91), Jordan Reed (-2 to 91), Patrick Mahomes (+2 to 90), Sean Lee (-4 to 90), Shaq Mason (+3 to 88), George Kittle (+3 to 87), Kyle Fuller (+3 to 86), Jaire Alexander (+4 to 84), and Andy Dalton (+3 to 84).